Microbubble (MB) arrays - fabricated in polydimethylsiloxane (PDMS) using our the patented gas expansion molding (GEM) process are being developed as a novel screening tool to identify and characterize tumor initiating cells. 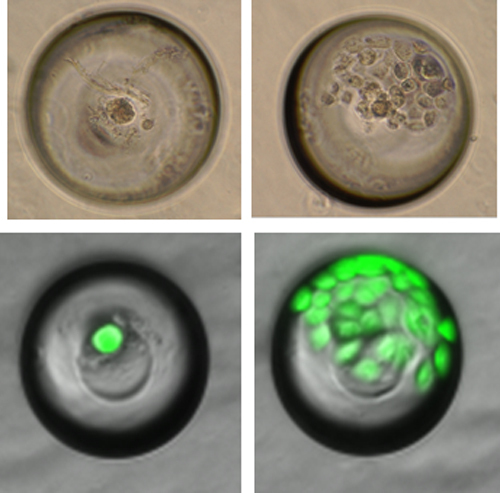 Morphologically distinct clones are cultured from single cells, they are recovered and functionally characterized. Single cell survival and proliferation is enabled by the unique architecture of the MB well and its physiochemical properties. Low surface energy and compliant substrate favor nonadherent cell proliferation and sphere formation which are hall marks of tumorigenic cells. Cell that are resistance to chemotherapeutics is one approach taken to enrich for aggressive tumor cells. Studies find that cancer cells cultured as nonadherent spheres on PDMS are enriched in stem cell markers and they exhibit higher single cell clonogenic potential1. We have also shown that the MB compartment can be used to study the epidermal-mesenchymal-transition (EMT) which is process that metastatic cells undergo 2. 1 Enriching and characterizing cancer stem cell sub-populations in the WM115 melanoma cell line. Chandrasekaran S, DeLouise LA. Biomaterials. 2011 Dec;32(35):9316-27. doi: 10.1016/j.biomaterials.2011.08.056. Epub 2011 Sep 13. 2 Microenvironment induced spheroid to sheeting transition of immortalized human keratinocytes (HaCaT) cultured in microbubbles formed in polydimethylsiloxane. Chandrasekaran S, Giang UB, King MR, DeLouise LA. 2011 Oct;32(29):7159-68. doi: 10.1016/j.biomaterials.2011.06.013. Epub 2011 Jul 2. Researcher: Lisa A. DeLouise, Ph.D.